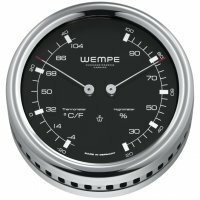 The WEMPE thermometer/hygrometer combination of the PILOT III Series is a reliable assistant in forecasting weather of the next few days, as is combines the function of temperature measurement and display of relative humidity level in one instrument. Both measurements are indispensable factors at sea. This marine instrument is not only useful but also very decorative. The stainless steel housing with black clock face stands out among other nautical gadgets. Temperature and humidity level are displayed with LumiNova indexes. 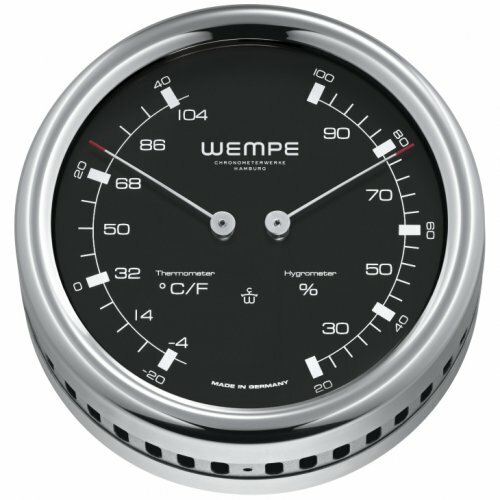 The WEMPE thermometer/hygrometer PILOT III is 100mm in diameter, the clock face is 85mm large. Therefore, the results can be easily read.